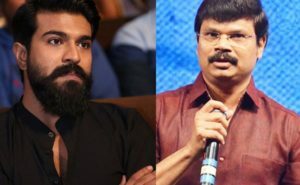 Accepting the failure of ‘Vinaya Vidheya Rama’, Ram Charan recently wrote a letter to his fans telling them that he’d be careful with his next films and would work harder and deliver better films which meet their (fans) expectations. “When Ram Charan delivered big flops like “Bruce Lee” and “Toofan”, why did he not write letters to his fans? Do you know my flop film collected bigger revenue than some of your hit movies (Danayya’s),” he slammed Danayya. Danayya was the producer for ‘Bruce Lee’ that starred Ram Charan and it was directed by Sreenu Vaitla. The movie was bigger flop than ‘Vinaya Vidheya Rama’. The pre-release of “Vinaya Vidheya Rama” was done for Rs 90 Cr and the movie collected Rs 62 Cr from theaters. Rs 30 Cr losses were incurred. “Bruce Lee”, on the other hand, didn’t recieve 30 percent of its investment. Boyapati miffed with this double standards. Previous articleAdivi Sesh Getting Married to Actress?